It is good to see that Garsington Opera's terrific production of Mozart's Idomeneo (see my review) is in the Opera and Music Theatre category, along with the Opera North Ring Cycle and the Royal Opera's production of Philip Venables' 4.48 Psychosis (which is coming back in Covent Garden's 2017/18 season). Young artists are also heavily featured. As well as the Young Artists category which includes Mirga Grazinyte-Tyla (in the Conductor category too), Andrew Gourlay, Joseph Middleton and Heloise Werner, Allan Clayton is in the Singer category along with Christine Rice and Karita Mattila, whilst the Southbank Sinfonia is in the Orchestra category, and Mark Simpson is in the Chamber Scale Composition category. The winners will be announced at a ceremony on 9 May 2017, and the trophies will be presented by Stephen Hough. 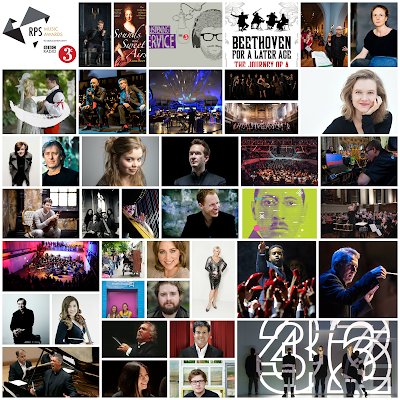 Full details of the shortlist from the RPS Music Awards website.